Vladimir Nabokov was famously no fan of literary biography, dismissing it as so much ‘psycho-plagiarism’. It was therefore inconsistent as well as rash of him to agree, in 1968, to countenance just such an attempt on his own life. If there is a hint of the homicidal in that choice of phrase, this is not, given the way things turned out, excessively melodramatic. Still under thirty at the time, Andrew Field was an American critic living in Australia. 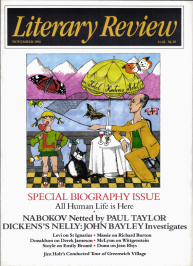 His exceptional command of the Nabokov corpus (especially the early work in Russian) led to his being commissioned to produce a complete bibliography of the master’s published works. The resulting intimacy between the two men emboldened Field to answer (as he put it) ‘an unplaced ad to be your Boswell’. On the understanding that he would have ‘the final word’, the author gave his devotee the go-ahead.